Shema Yisrael: This community-wide learning event will be held on Sunday November 13, and is sponsored by and will feature clergy from Congregation Albert, Congregation B’nai Israel, and Nahalat Shalom. Hosted by Congregation Albert, this Global (well, All Abq) Day focuses on the quintessential Jewish prayer - the Shema - the unifying text of the Jewish people. 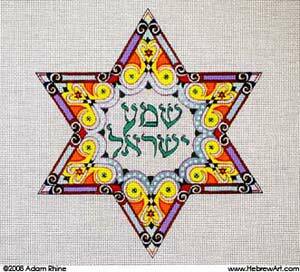 For the Jewish people, the Shema is a call, a slogan, a sign of identification and an expression of great emotions. It is a declaration of bond, principles and identity. Shema Yisrael, "Hear O Israel," has been with us from the very beginning of our history. These words have accompanied our people for thousands of years - in its homeland and in exile, in times of peace and war, in the gas chambers and along with the cries of triumph. This was our "password"; it is how Jews recognized each other - despite geographical, linguistic and cultural differences. 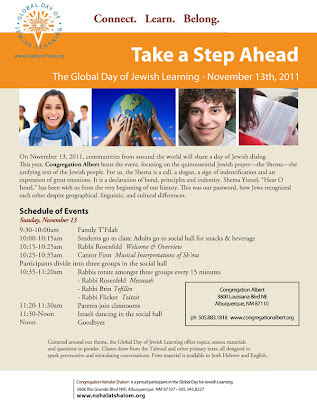 Centered on our theme, the Global Day Curriculum will offer topics, source materials and questions for conversation. Classes will be drawing from the Talmud, as well as from other primary texts (everything will be available in both Hebrew and English), and are meant to spark provocative and thought-provoking conversations.